Hold on for a safe but exhilarating river-running experience! Put in at the lake at the foot of the spectacular Mendenhall Glacier, and be carried away by the river through views of towering mountains, forests and wildlife. There's a lot of everything in this trip! Begin with a scenic tour up the Mendenhall Valley. 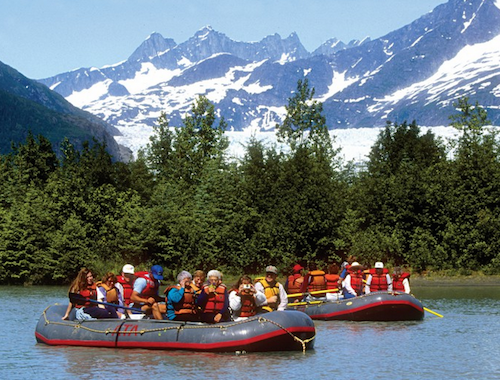 On the shores of Mendenhall Lake, don protective rain gear and life jackets, and board your raft. Each holds up to twelve, and is rowed by an experienced guide. Or, if you're looking for a hands-on experience, join a paddle-raft team. Glide across the iceberg-studded lake, marveling at the 150-foot-high, 1.5-mile-wide glacier face, and set course downstream. The six-mile route combines meandering stretches with Class II and III whitewater rapids. The rapids are perfectly safe, just exciting enough for beginners, and appropriate for all ages. This is a treat for experienced rafters, too! Encounter river features such as Moon Flats and Pin Ball Alley. Watch for the photographer on shore who snaps your picture, capturing the thrill of your adventure! Where the river levels out, soak in the views of the riverbank, lush forests, and 7,000-foot mountains above the valley floor. Learn about the natural history of the river, and you're likely to see bald eagles, birds nesting in rocky cliffs, black bears, otters and seals, and salmon during spawning season. At the haul-out, celebrate with an Alaskan-style snack. You can purchase a cup of 'Martha's Mendenhall Madness' to toast your adventure, or an action photo of yourself as a lasting memento of a trip you'll never forget. Suitable for all ages and no prior experience necessary, just good health and an adventurous spirit. For those wishing a higher activity level, we offer paddle-rafting adventures. Children must weigh at least 40 pounds in order to fit into required life jackets. Children 12 and under must be accompanied by an adult. Children ages 13-17 must have a signed parental consent form to participate in the absence of a parent or guardian. This tour operates under a Special Use Permit issued by the U.S. Forest Service. Some final notes: bring your vouchers and dress comfortably for the weather (if your tour is on the water it will be about 10 degrees cooler.) Camera and binoculars are suggested for land-based tours. However, while on tours involving rafts, canoes and kayaks, we suggest you bring disposable cameras.